The goal of this tutorial is to give you a quick introduction to PyAlgoTrade. As described in the introduction, the goal of PyAlgoTrade is to help you backtest stock trading strategies. Let’s say you have an idea for a trading strategy and you’d like to evaluate it with historical data and see how it behaves, then PyAlgoTrade should allow you to do so with minimal effort. Before I move on I would like to thank Pablo Jorge who helped reviewing the initial design and documentation. This tutorial was developed on a UNIX environment, but the steps to adapt it to a Windows environment should be straightforward. These are the classes that you define that implement the trading logic. When to buy, when to sell, etc. These are data providing abstractions. For example, you’ll use a CSV feed that loads bars from a CSV (Comma-separated values) formatted file to feed data to a strategy. Feeds are not limited to bars. For example, there is a Twitter feed that allows incorporating Twitter events into trading decisions. Brokers are responsible for executing orders. A data series is an abstraction used to manage time series data. These are a set of filters that you use to make calculations on top of DataSeries. For example SMA (Simple Moving Average), RSI (Relative Strength Index), etc. These filters are modeled as DataSeries decorators. These are a set of classes that allow you to distribute backtesting among different computers, or different processes running in the same computer, or a combination of both. They make horizontal scaling easy. Declaring a new strategy. There is only one method that has to be defined, onBars, which is called for every bar in the feed. Loading the feed from a CSV file. Running the strategy with the bars supplied by the feed. # We want a 15 period SMA over the closing prices. We’re initializing an SMA filter over the closing price data series. We’re printing the current SMA value along with the closing price. All the technicals will return None when the value can’t be calculated at a given time. The first 14 RSI values are None. That is because we need at least 15 values to get an RSI value. The first 28 SMA values are None. That is because the first 14 RSI values are None, and the 15th one is the first not None value that the SMA filter receives. We can calculate the SMA(15) only when we have 15 not None values . If the adjusted close price is above the SMA(15) we enter a long position (we place a buy market order). If a long position is in place, and the adjusted close price drops below the SMA(15) we exit the long position (we place a sell market order). # Wait for enough bars to be available to calculate a SMA. # Enter a buy market order for 10 shares. The order is good till canceled. # Evaluate the strategy with the feed. This is ok if we only have to try a limited set of parameters values. But if we have to test a strategy with multiple parameters, then the serial approach is definitely not going to scale as strategies get more complex. Providing the bars to run the strategy. Providing the parameters to run the strategy. Recording the strategy results from each of the workers. Running the strategy with the bars and parameters provided by the server. 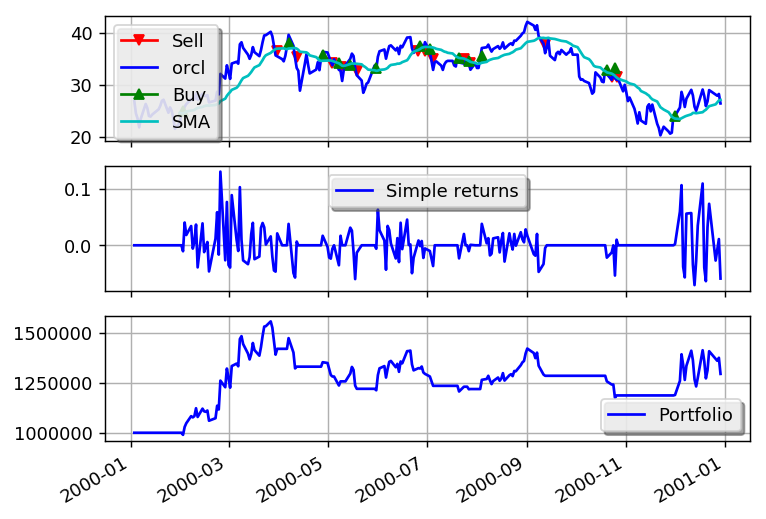 An SMA period for trend identification. We’ll call this entrySMA and will range between 150 and 250. A smaller SMA period for the exit point. We’ll call this exitSMA and will range between 5 and 15. An RSI period for entering both short/long positions. We’ll call this rsiPeriod and will range between 2 and 10. An RSI oversold threshold for long position entry. We’ll call this overSoldThreshold and will range between 5 and 25. An RSI overbought threshold for short position entry. We’ll call this overBoughtThreshold and will range between 75 and 95. If my math is ok, those are 4409559 different combinations. Testing this strategy for one set of parameters took me about 0.16 seconds. If I execute all the combinations serially it’ll take me about 8.5 days to evaluate all of them and find the best set of parameters. That is a long time, but if I can get ten 8-core computers to do the job then the total time will go down to about 2.5 hours. Long story short, we need to go parallel. # We'll use adjusted close values, if available, instead of regular close values. # Wait for enough bars to be available to calculate SMA and RSI. # The if __name__ == '__main__' part is necessary if running on Windows. # Load the bar feed from the CSV files. Declaring a generator function that yields different parameter combinations for the strategy. Loading the feed with the CSV files we downloaded. Running the server that will wait for incoming connections on port 5000. Note that you should run only one server and one or more workers. Declaring a generator function that yields different parameter combinations. Using the pyalgotrade.optimizer.local module to run the strategy in parallel and find the best result. PyAlgoTrade makes it very easy to plot a strategy execution. # Attach a returns analyzers to the strategy. # Attach the plotter to the strategy. # Include the SMA in the instrument's subplot to get it displayed along with the closing prices. # Plot the simple returns on each bar. Running the strategy with the bars supplied by the feed and a StrategyPlotter attached. I hope you enjoyed this quick introduction. I’d recommend you to download PyAlgoTrade here: http://gbeced.github.io/pyalgotrade/downloads/index.html and get started writing you own strategies. You can also find more examples in the Sample strategies section.